So far we’ve explored the physicality of human movement as a means to understand ways of ‘seeing’, ‘interpreting’ and ‘communicating’ what could be animated. However, good animation requires more than just understanding human action to make it effective. More often than not, animation invests itself into a fantasy form in a fantasy world that has to be created outside (but often based upon) what we identify with in the real world. For the traditional hand-drawn animator especially, the notions of ‘form’, ‘shape’ and ‘volume’ are essential in achieving this – especially where they has to be consistent in style and action with a single character throughout a long story driven production. CG/3D animators have it a lot easier in this sense, as they are working with an established character model that it would be very hard to lose consistency of ‘form’, ‘shape’ and ‘volume’ during the animation process. (That said, to have a thorough understanding of a character in all 3 dimensions will certainly help the CG animator move it all the better!) 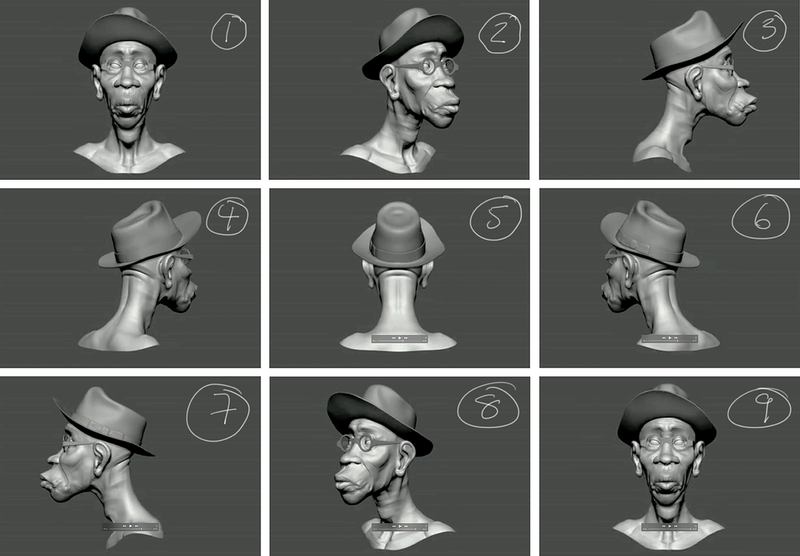 The designing, concepting and modeling of CG characters for 3D animation is another matter. For in creating any one of those characters a great deal of visual and structural understanding is required of the whole 360-degree design before it can be given to the animators for breathing life into. This months’ challenge therefore is all about the seeing, understanding and interpreting an imaginary character in three dimensions. As part of a traditional, 2D movie project development, I once I had some amazing concept art of a critical character in the storyline (“Cooper”) turned into a 3D model - so that should the project (‘Bad Penguin’) ultimately find its funding the 2D team animators would all entirely understand what that character would look like from every conceivable angle. This is merely a digital-age extension of the model or ‘machete’ approach that many big studios adopted in the good old ‘golden’ days of 2D animation – so that their traditional animators could touch and see the characters being animated from multiple angles when required. This challenge is NOT looking for drawing ability at all! What it is looking for however is consistency of ‘form’, ‘shape’ and ‘volume’. Construction lines and other visual supports to achieve your aim are not only acceptable but are strongly recommended! The final product has to show how much you understand the turning shapes involved and how you consistently communicate this on the page through your successive reference sketches. FINAL HINT: Position ‘ 1 ’ and position ‘ 9 ’ are identical by the way! You have until MIDNIGHT (Pacific Time), SUNDAY, MAY 24th to submit your drawings onto our Facebook Group page!.